Bridget inside her home with her dog George. Picture by Scott Baxter. 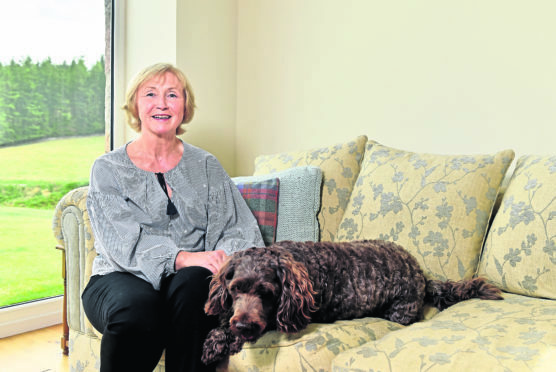 The now 57-year-old was living in a tiny cottage in the city and longed for the space and light she remembered from her childhood holidays in the north-east. Growing up in Hertfordshire, school holidays meant a trip to Lumphanan where her father owned some land and a small cottage. Glorious weeks would pass as Bridget and her brothers ran wild in the surrounding fields and forests, before she grew up and moved to London. But despite life in the glamorous big smoke, Bridget never forgot the charm of the rolling Aberdeenshire countryside, and when the opportunity arose to build her own house, she knew the perfect spot. 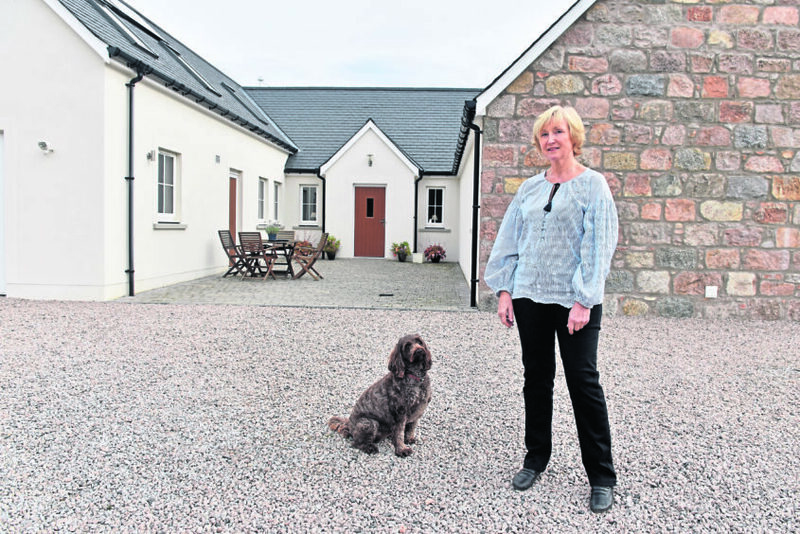 “My grandfather was a crofter just along the road from Perkhill,” she said. “My father got a scholarship to the Grammar School and eventually worked abroad with the foreign office. When he came back, he invested in land in the area, including Fernie Brae Cottage where I spent my summers as a child. “Eventually my father retired to the area, and when he died I bought the cottage from his estate. As if building a house isn’t difficult enough however, Bridget coordinated the whole thing from London. Planning began in 2012 and the build was finished roughly three years later. “I left my job in early 2016 and moved up to the area at last,” she said. “At that point the job market had crashed in Aberdeen so I knew finding employment might be tricky, yet I wanted to live in this house no matter what. “I ended up designing it with different options, so part of the house can be closed off as a holiday rental and other rooms can be used as a B&B. “Originally I was hoping to tempt my children to live up in the area as the quality of life is just so much better here. “But it didn’t work out, so when they are not here visiting I use the extra space to run a B&B business. “When I left work in London I was pretty fed up with the whole human race to be honest, but running a B&B has been just lovely. Countless glowing reviews from her guests praise both Bridget’s fabulous hospitality and her stunning five-bedroom home. Designed to make the most of the natural light, various floor to ceiling windows offer panoramic views of the surrounding countryside, while high ceilings and neutral decor emphasise the sheer size of each room. 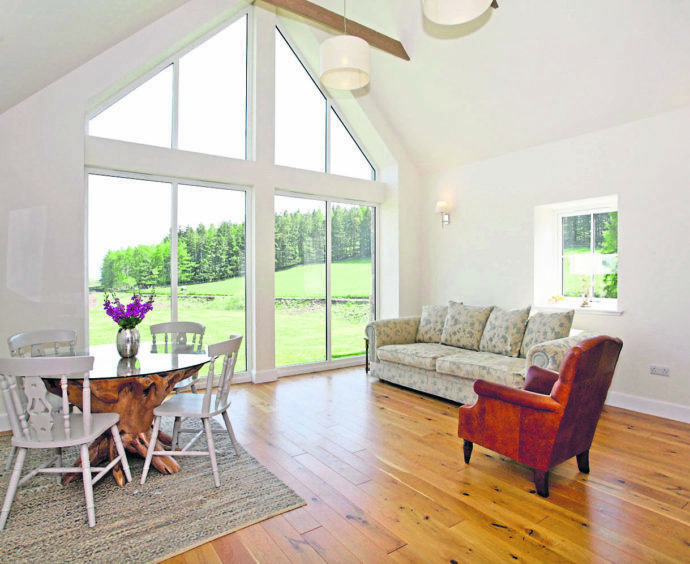 “I lived in a tiny cottage down south so I wanted something big and bright with lots of space,” Bridget said. “I’m not one for keeping clutter and I love simple decor. My favourite room is the kitchen, which is definitely where I spend the most time. The sun comes in in the morning and I just love the exposed beams. “There’s plenty of room for the whole family to sit and eat breakfast together, which was a really important factor for me. 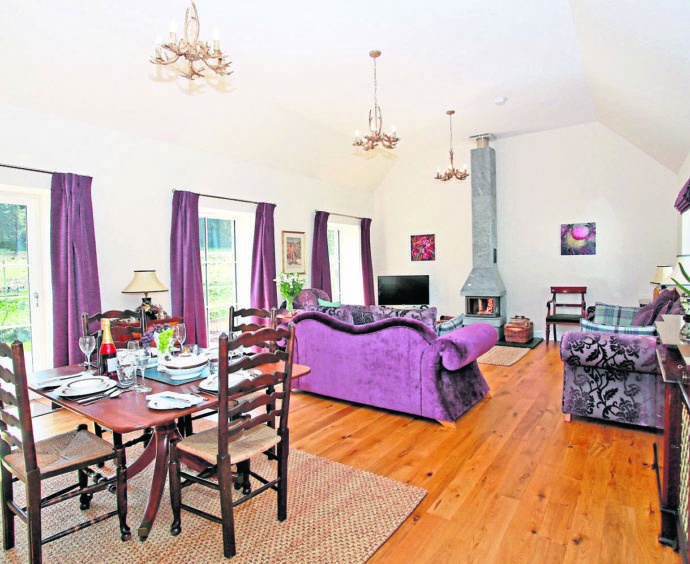 The ground floor is also home to two large en suite bedrooms, a WC and utility room. Upstairs three further bedrooms are on offer along with the well-appointed family bathroom. Outside, the property is set in approximately three acres, with two different patios ideal for outdoor entertaining. But times have changed for Bridget, who will soon be moving back south of the boarder. “My son is getting married and having children, so I want to be closer to them,” she said. “I’ve loved living up here and thoroughly enjoyed life at Fernie Brae House. “I’m so glad I gave it a go. My father retired up here and my brothers have drifted up here too over the years. “I wanted to see what I was missing and I’ve loved it. “Down south it’s all about working to survive, whereas up here it’s not all about earning a living – it’s also about enjoying the country and the community you’re in. 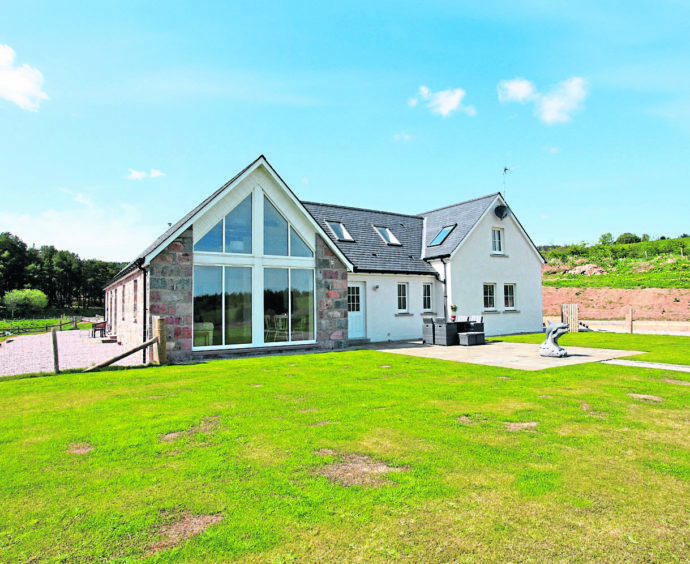 Offers should be made in the region of £530,000. Raeburn Christie Clark & Wallace on 01330 822931.